A Truth Universally Acknowledged: 33 Reasons Why We Can’t Stop Reading Jane Austen. Another bargain find at Sydney, Central Station’s Basement Books (I believe for $4.95 although this hardback has been sitting on my shelf for quite a while and I can hardly remember). This is a collection of 33 essays from a range of academic names, film directors and even fiction writers and psychologists about their own personal journeys with Jane Austen. Featuring the instantly recognisable names of C. S. Lewis, Virginia Woolf, Amy Heckerling and J. B. Priestley it’s an absolute gem. For those readers who don’t live in Australia, or watch the news, Queensland is currently undergoing a terrible natural disaster. There is widespread flooding, leaving a trail of destruction of homes, belongings and cars- and worst of all causing there to be numerous missing people and deaths. It is hard to imagine this sort of terror happening in one’s own country, if in the world at all and what those people are going through we can only guess at. Luckily, Australians seem to stick together in times of crisis. We saw this through the Victorian bushfires, and we see this again with the outpouring of support and fundraisers at this current time. One such fundraiser is from the blog of Zinnia Pea who is selling a Jane Austen tea pot via auction to raise money for those in strife, the money of which will then be donated to the Queensland Government’s Flood Relief Appeal. Jennifer Ehle and Colin Firth together again? I hate to keep up with Hollywood gossip, and what actors/actresses are doing, but ever since the A&E/BBC ’95 Pride and Prejudice with Jennifer Ehle and Colin Firth, I have personally longed to see them both grace the screen together again. My wish was granted, in a bizarre way, with both having returned to act in The King’s Speech (released 10 December 2010), which I have just seen at the movies. Are you zombied to death yet? Because March of this year we can look forward to the release of the third instalment in the Pride and Prejudice and Zombies series. 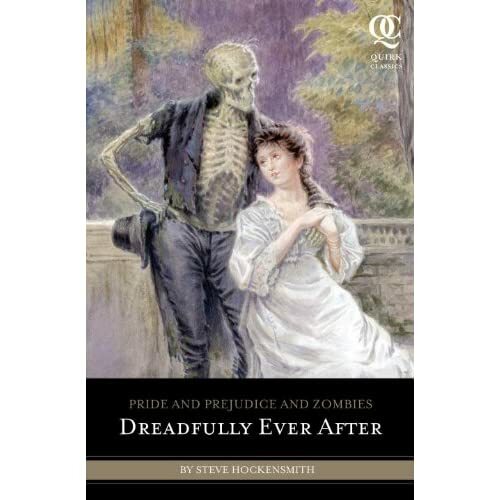 “Pride and Prejudice and Zombies: Dreadfully Ever After” with a reportedly zombied-up Mr. Darcy on the front cover. Although, to be honest, I’m not 100 per cent sure what I’m looking at below. It’s already available for pre-order and I am sorely tempted. RRPing at (US)$12.95 according to Amazon, it sounds like a bargain (particularly if Hockensmith can keep up the effort from Dawn of the Dreadfuls). The title is a nice little wordplay, and manages to give nothing away about the story itself (will it really be dreadfully? Somehow I think not.) which is refreshing.